Arriving today: My new Calphalon Hard-Anodized Stock Pot and a Breville Gourmet Electric Wok. First up: the stock pot. It really is a gorgeous thing. The anodized aluminum is matte and very sleek looking. It is nice and heavy, and will heat evenly on my crappy apartment circa-1980 stove. I’m very excited because I don’t have anything close to this 12-quart size, and I can now properly boil pasta without overflowing. Apparently pasta needs to “have room to swim”. Well, pasta, you just got a brand-new Olympic-sized pool. The Breville Electric Wok, in all its glory, is huge. I mean, really big. I have no idea where I am going to store it. Gonna have to get creative. Maybe the laundry room. And it is HOT. Literally. This thing gets up to 425 degrees, but it also has settings for other things like soups that cook at lower temperatures. 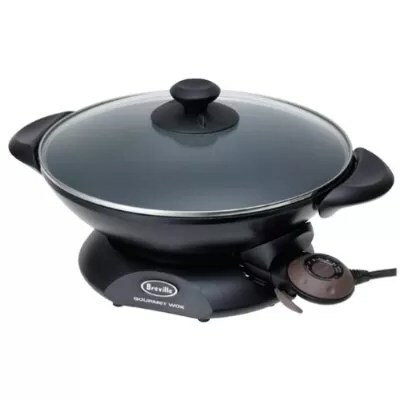 I’m thinking an electric wok will be a great addition to my kitchen because it doesn’t take up stove space, and I can cook quick, healthy meals — great for weeknight cooking. Very excited to use both my new toys! Will let you know how it goes.